Bowen Designs is using a new crop of digital sculptors for many of its Marvel Comics Statues and coming up with some fantastic results. One of my favourites is Khurram Alavi, who has hit each of his Bowen assignments out of the park. The Bowen Designs Thanos Museum Statue was released late last year, and fills a big gap on my Cosmic Marvel shelf. The cosmic characters that populate the Marvel Universe really capture my imagination, and stories from The Infinity Gauntlet through to Annihilation and beyond are some of my favourites. Thanos is a key character in these tales and therefore stands central in my Cosmic Marvel display - which, I should add, really needs a bit more attention from Bowen! 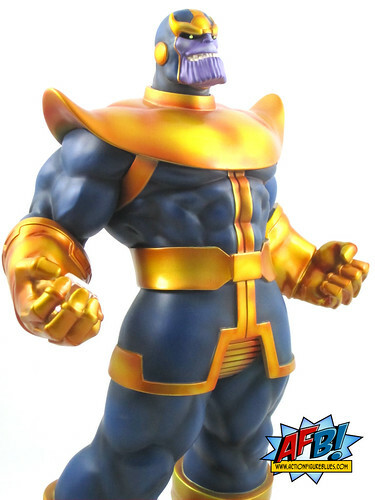 Thanos himself has had his fair share of attention from Bowen over the years, with a previous statue and two mini-busts already released and a Thanos on throne version and Faux Bronze revisit of the original statue on the way. 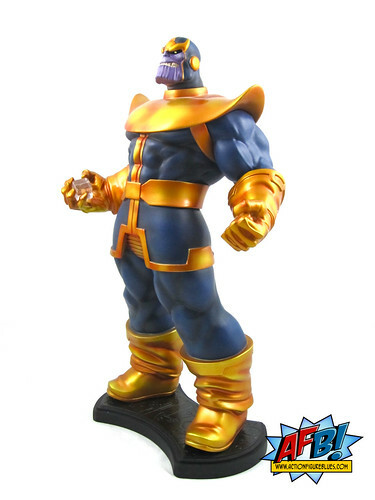 With the previous Thanos statue being rather elusive on the secondary market, this new version is a good option for collectors who haven’t yet added him to their display. 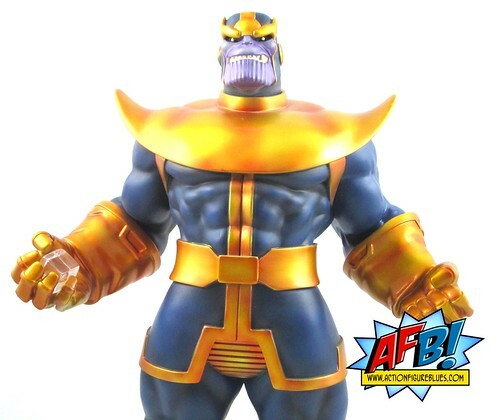 If you’re considering purchasing this item, an important thing to note up front is that Thanos is not wearing the Infinity Gauntlet in this version. If that’s essential to your idea of Thanos then you’re going to need to look at other options. Instead, this version holds the Comic Cube. I wasn’t bothered by this at all - in fact the Cosmic Cube is a more novel inclusion - but it may put some people off. Being a collector that is short on display space and likes to be able to display characters in groups, this is a great piece. The base is thin and compact which means that it can be displayed with other statues easily. The pose that Alavi is chosen is powerful - Thanos has both fists raised in majestic style as he clutches the Cosmic Cube in his right. There are details aplenty to appreciate on this piece. Each element of Thanos’ costume is sculpted - all of the ridges on his body suit, his gloves and the various buckles that adorn his gear are sculpted - no cheating by just doing it with paint here. Thanos’ headsculpt is also excellent, capturing him at his malificent best. The paint job on this statue is excellent. The metallic gold is striking and very well applied, while a wash on the darker tones of Thanos’ bodysuit provides clear muscle definition. The blue on the bodysuit is a touch dark for what I think of when I think of Thanos, but the overall look is very effective. The only niggle I have with this piece is the scale of the Cosmic Cube. 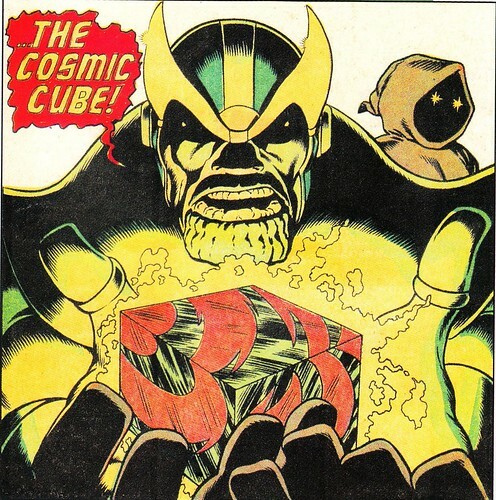 While Thanos is an oversized being, I still think the Cube could have have been bigger and have found art which supports this- see below. This doesn’t hinder my enjoyment of this great piece by any means. While we can overdose on the A list characters in these lines, it’s great that Bowen recognises the popularity of characters like Thanos and gives collectors the opportunity to add them to their displays without having to chase down overpriced items on eBay. This statue is a very welcome addition to my ever growing Bowen display! Wow. Amazing piece of my favorite comic character ever. I'd love to be able to get one of the Bowen statues of him one day. I think I prefer this over the Infinity Gauntlet.